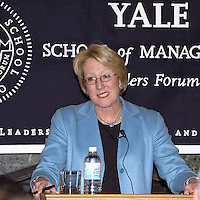 Anne M. Mulcahy, Former Chairperson and CEO of The Xerox Corporation, speaks at the Yale School of Management Leaders Forum 1st of February 2005. 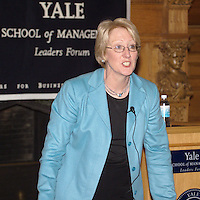 This is the full edited selection of views of Ms. Mulcahy's forum presentation at SOM. The Leaders Forum is a periodic gathering of students and industry leaders for which the Dean brings in CEO's, CFO's and other prominent Business Top Management and Leaders to speak in an open forum setting usually with a prepared presentation of the leaders life story of achievement followed by an open Q & A.